Samus and Link Suits Pop Up in Dynasty Warriors Vs.
Tecmo Koei's next Dynasty Warriors game for 3DS, Dynasty Warriors Vs., features some interesting sartorial options for discerning Nintendo fans. 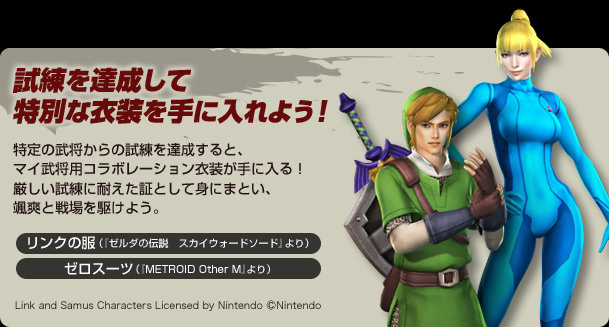 The Japan-only scrapper lets you dress up as Link or Samus in her Zero Suit. They're included on the cart, but you'll have to get far enough in the tutorial mode to unlock them. Note that these are not the characters themselves, they are simply their outfits. Your Mii will also pop up from time to time to help out in battle, summoning rampaging elephants and things of that ilk. They're not the characters, they're Dynasty Warriors characters wearing the suits. Link just looks weird but Samus looks okay...in a weird sort of way..Any chance this game will make it to north America? Ah, I guess that explains it. Can you make a man wear a samus suit? "link looking alright,then looks at samus"
That's pretty interesting. I now hope this thing comes stateside. Sweet! I especially like how the Link costume resembles the style introduced in Skyward Sword. ...Huh... I wonder if this will come to the US. @DictatorJM: So, there's a bad reason to play as ZSS? I'm stoked for this game. More importantly than this, Ryu Hayabusa and Ayane are in it, and Yukimura Sanada and some other SW characters. I'm hoping more DLC costumes will pop up, maybe Captain Falcon? I loved Samurai Warriors Chronicles, so this is definately on my radar. With Ryu Hayabusa and Ayane in it, along with Link and Samus costumes, that even raises my interest even more. i havent played dynasty warriors 3 4 2 or 6 in awhile but putting link and samus in a game like that WTF? of course not for the US just Japan Y!!!!!!!!!!!!!!!!!!!!!!!!!!!!!!!!!!!!!!!!!!!!!!!!!!!!!!!!!! Great suit design, horrible character design. Cool! But sadly it is wasted on a game series that doesn't seem that great (from what I have heard).